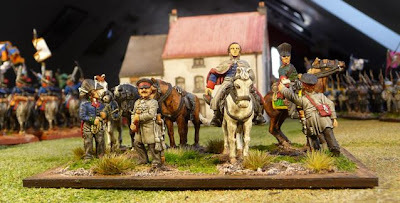 About a month ago, Curt at Analogue Hobbies made a comment to me something along the lines that it would be impressive to see our assembled Napoleonic armies. This made me think: I have never placed all my figures on the table, and I was not even sure how many figures I had painted. I was not even sure when I started. I had look through Quicken, and found that I started to buy the occasional figure around 2003. 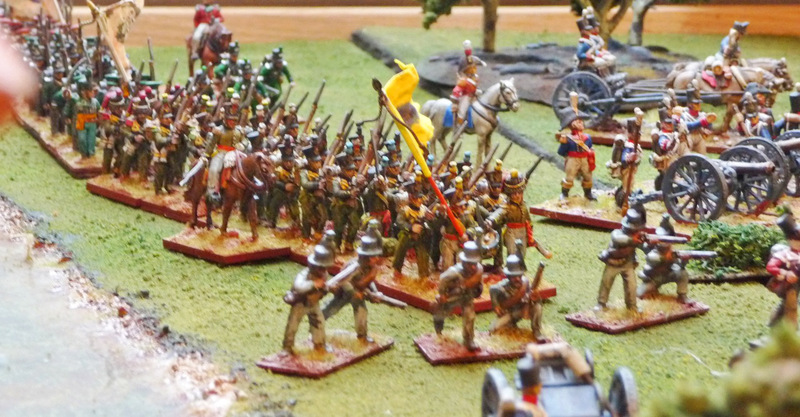 I initially bought some 1/72 plastics from Michigan Toy Company; I suppose that is what I knew as I still had six boxes of Airfix Napoleonics from 1974, my second year in university. 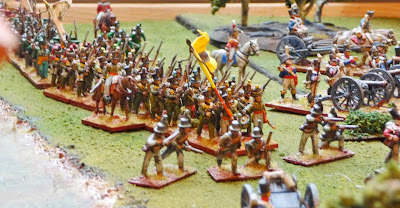 I then heard from somewhere that there were metal figures out there (internet wargaming at the time was in it's infancy), so I thought a good match would be some Minifigs, they were not! I did go ahead and paint several battalions in a very rudimentary fashion. I was still unsatisfied, however, as at the same time my son was painting up some GW Lord of the Rings figures and they were light years ahead of the Minifigs. I then heard of Foundry and ordered a few figures from them and also from Front Rank. Initially I thought I could fit them in with my Minifigs, well it was clear that was not going to happen. So on January 15, 2007 a review of my financial records show that I made my first major purchase from both Foundry and Front Rank of French and British Napoleonics. Somewhere in between I sold all the Minifigs and the 1/72 plastics, I had assembled. 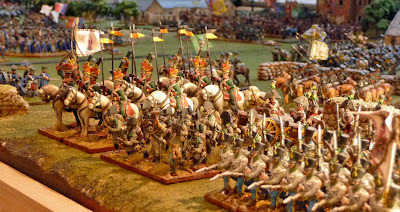 So just five years ago, I got stuck in with the 28 mm Napoleonics. So in between all the contests, I thought I would lay out what I had done and try to do up a tally. You can have a look at the roll call to the left and see what I have done. I found it really quite difficult to get good photos of all but what follows is an attempt. In the five years, I also have built a 12'x5' foot terrain table, constructed multiple terrain tiles and painted several buildings and other terrain pieces. All is laid out below except for my 15mm Hovels Hougoumont complex that can be seen elsewhere. Some Allied reinforcements, my next focus once I get the Prussians done. Let's not forget the Portuguese. The guerillas are from Redoubt, some of the worse figures I have bought, but they do have some charm, they were painted about 5 years ago. Some Austrians, I am not yet sure where they fit in as I am focused on the Peninsula and les cent jours periods. 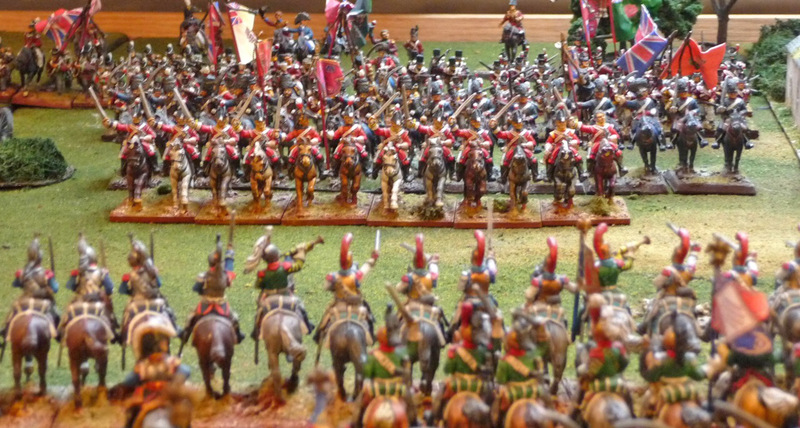 They were very nice to paint though, I believe I will paint up a full brigade eventually. Have two more infantry battalions, some Landwehr, one more cavalry unit and one more gun to paint up. This unit was probably painted 5 years ago. Pretty rough! This unit was finished within the last week, one can learn! I do like Army Painter dip......non dipped that is! 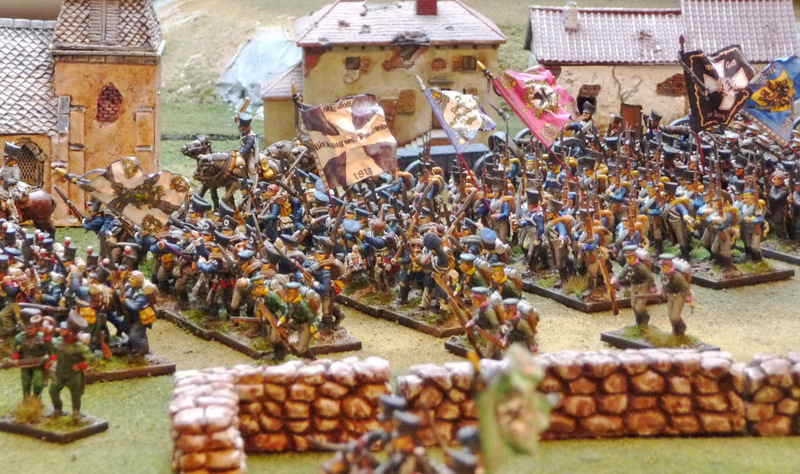 TMP is a great resource, but it is very difficult to get unbiased information on rulesets; my advice is to buy every Napoleonic ruleset as they come out!! 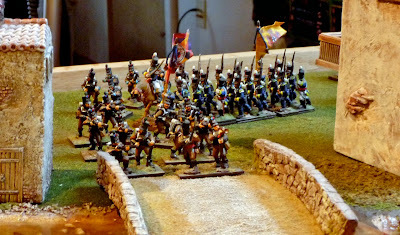 Well I have to say that I really enjoy this hobby, and I want to thank all who have a look at my blog. Wow, very impressive. Love the squares and the artillery in a row!!!! I have been gaming the Napoleonic era since the 1980s. It took me much longer to learn some of the lessons that you already have learned! Your collection is fantastic! That is an awe-inspiring collection, thanks for sharing. It certainly provides inspiration for me to keep working on my meagre collection. Your collection looks great, collectively and individually! I chuckled when I read your post on TMP mentioning being in yur 2nd year of Unoersity in 1974, as it was also my 2nd year in college and when I transitioned from my old Scruby figures to Minifigs; I didn't finally retire the Scrubys until about 12 years ago. Unlike you, I kept burying and painting non stop through med school, Residency and beyond. 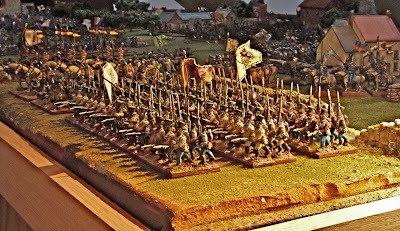 I'll have to do something like this eventually, but it will have to be one army at a time or it won't fit on the table, LOL! "Buy every Mapoleonic set as it comes out." Priceless! Wow that is just awesome! I'm just embarking upon the early days of collecting historicals. 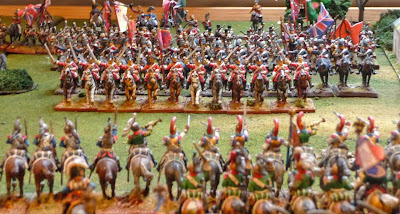 Right now I'm going with Romans and Western, but I plan to slowly move towards Napoleonics (probably 2013, once I have a big collection of Romans, etc.). Any advice for a historicals noob guys? Waouh! Great collection on such a short period of time! Are those walls made from Hist Arts moulds? A fantastic collection, there! Very impressive. I'm very happy you did this, John. Your collection is very inspirational - an excellent example of what a person can do if they are inspired by both the hobby and the history. Beautiful work - bravo! Awe inspiring armies and models you have there.. makes me want to pull out my English Victrix and finish them up or my HaT Russians..
Really beautiful layout and great to show what five years work can deliver. Impressive! I only started painting Napoleonics 3 2 1/2 years ago, but if I multiply the minis I have done during that time, by the time you spend on yours I will be nowhere near those numbers. Make that 2 1/2 years. Hi John, this is my 3rd attempt at posting. All I can say is WOW, WOW nad WOW!!! Your collection is totally inspiring!! !